Video clip synopsis – In 2007 Australia celebrated the 75th anniversary of the Sydney Harbour Bridge, a giant steel arch resembling a coat hanger that has became one of world's most recognised structures and an engineering triumph. Broadband MP4 building_bb.mp4 (13.9MB), suitable for iPods and computer downloads. Building the Bridge is an excerpt from the film The Bridge (55 mins), the first episode of the three-part series entitled Constructing Australia, produced in 2007. Celebrating the 75th anniversary of one of Australia’s most loved icons, this is the definitive story of the building of the Sydney Harbour Bridge and the vision of those who made it happen, despite their personal conflicts and political intrigues. The Bridge was developed with the assistance of the New South Wales Film and Television Office. Produced with the assistance of the Australian Broadcasting Corporation. A Film Australia Making History Production in association with Real Pictures. What was the contribution and significance of at least ONE Australian, ONE important event and ONE political development during the interwar period? 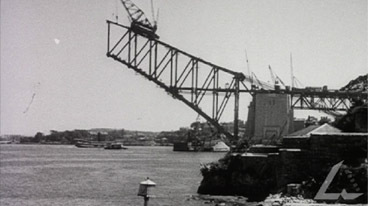 The significance of at least ONE important event – the building of the Sydney Harbour Bridge. Massive, majestic and breathtaking, the Sydney Harbour Bridge was the greatest engineering challenge of its day anywhere on earth. Nothing like it had ever been attempted in Australia. It not only altered the life of a city forever, it became a symbol of a bold young nation and a changing world. At a time when there were only 30,000 cars and trucks in the entire city, the Bridge could carry 6000 vehicles and 160 trains every hour and all of Sydney’s people could have easily crossed it in a single afternoon. With its graceful arch rising high above the famous harbour, it remained the tallest structure in the city until the late 1960s. The building of the bridge provides the backdrop for a particularly turbulent period of both national and state politics. The advent of the Great Depression found governments having to rapidly adjust from boom times to massive unemployment. NSW Premier Jack Lang believed that government had the responsibility to protect its constituents, and was prepared to default on World War 1 loan payments due to Britain to maintain government spending and to keep people employed. Lang’s social welfare policies, which supported the working class over the wealthy industrialists, created many enemies. Lang became a figure of hatred for some of the more divisive groups in NSW. The New Guard, a movement that appealed to conservative returned servicemen who were strongly anti-Communist, was deeply suspicious of Lang and his political and economic response to the Great Depression. It was a member of the New Guard, Francis de Groot, that slashed the ribbon at the opening of the bridge. The Sydney Harbour Bridge was completed during the dark days of the Great Depression and finished in March 1932. It is the legacy of a fateful partnership between two very different men— the brilliant engineer, J. J. C. Bradfield and tmaverick politician, Jack Lang—who shared a relentless ambition to create ‘the people’s bridge’. Today, it is impossible to imagine Sydney, and Australia, without the Sydney Harbour Bridge, a giant steel arch resembling a coat hanger that has become one of world’s most recognised structures and an engineering triumph. Why would a city like Sydney need a bridge? In the film The Bridge from which this extract was drawn, the argument is made that one of the reasons the Depression hit Australia so hard was because the British sent us a 400 million pounds bill for the money Australia had borrowed to support Britain in World War I. Outline the arguments for and against the idea that paying this money should’ve been a priority for all Australian governments. Explain why the bridge was referred to as Sydney’s ‘Iron Lung’ during the Depression. What does this tell you about the government’s priorities? Research the history of the New Guard. Use that information to write an entry for the organisation in an encyclopaedia of Australian history. How important do you think the building of the bridge was for developing a national sense of pride in the technical ability of Australia to produce major engineering works? Research evidence to support your answer. Argue for or against the accuracy of the following statement: ‘The building of the bridge became a symbol of a bold young nation and a changing world’. As a class, create a newspaper for 20 March 1932. The front page should convey the excitement of the official opening while also capturing the confusion caused by the actions of the New Guard’s Francis de Groot who subverted the official opening of the Sydney Harbour Bridge in 1932: mounted on a horse and dressed in a cavalry uniform, he was able to cut the ceremonial ribbon with his sabre before Premier Lang. Other sections could include fashion, entertainment, interviews, illustrations, world news, local and national news and sport. Design a web page advertising the 2032 celebrations for the centenary of the bridge.